Welcome to the April, 2018 Stampin' Dreams Blog Hop. You are currently visiting Karen Farquhar from Australia and this month's theme is 'My Favourite Designer' Series Paper. I hope you are inspired by my project today. I love this theme. Kylie Bertucci coined the hashtag ‘love it chop it’ and that’s what I intend to do for the next 2 months with my retiring Designer Series Papers. I have hoards of retired designer series paper taking up space in my craft room I felt was too precious to cut. But with my current Stampin’ Up! Designer Series Papers about to retire I am going to take Kylie's advise and use as much as I can to make way for the beautiful new papers on the way. 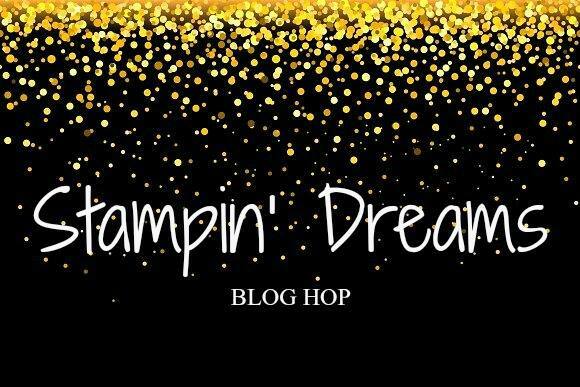 In a way this month's Stampin’ Dreams Blog Hop theme was a bit difficult. 'Favourite DSP' mmmm which one to choose? I decided to create a Grandmother's Brag Book of my newest Granddaughter using the gorgeous Painted with Love Designer Series Paper from the 2018 Occasions Catalogue. This paper has gold foil accents on one side and brushstroke imagery on the other. 12 sheets: 2 each of 6 doubled-sided designs. I had such fun creating this album. In between each page there are 3 hidden pockets to insert extra photographs, personal information and keepsakes. This is one of the sweet pages hidden in the pockets.